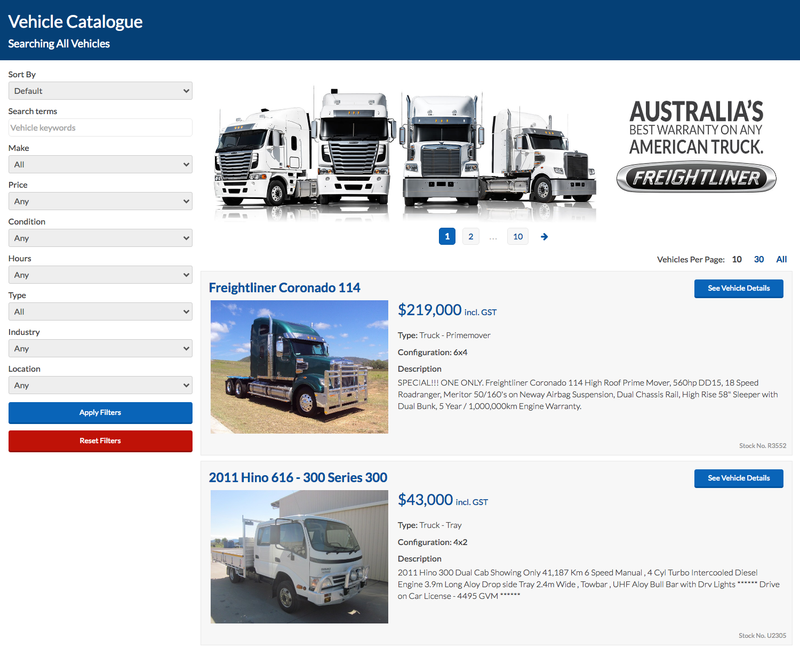 This month, Webtron launched a brand new website for one of Queensland’s largest truck dealers, Westco Truck Sales. Westco has 5 locations situated across all corners of the Queensland coastline. The Westco name is synonymous with new and used quality trucks, tractors, and implements. And has been for over 70 years. Like many contemporary businesses, Westco’s online sales channel has been integral to the company’s outward success. As well as the facilitation of local sales, the online platform has been an effective way to promote interstate sales. Westco sits at the forefront of the Queensland industrial equipment sales industry. We have streamlined the new Westco website to offer practicality and simplicity for modern day users. Its navigation menu has been simplified too. We also added a stock search engine to offer a more convenient way to browse trucks and trailers online. The new Westco Truck Sales website uses vehicle data feeds. Vehicle data feeds pull information out from a third-party source. Then they consolidate this information into one stock page. As a result, you have access to regularly refreshed website content. And it eliminates the need to enter multiple stock changes in the website’s back end. From an administrative point of view, vehicle data feeds allow information to be updated in a format that promotes ease of use when updating stock. Vehicle feeds are a valuable consolidator of stock information for vehicle wholesalers and retailers alike. Look out for the Westco Truck Sales updated e-commerce store, coming soon. For nearly ten years, Webtron has created e-commerce stores for a number of successful businesses throughout Australia. But if you would like to take advantage of an e-commerce website for yourself, check out our e-commerce page, or contact us now on 1300 932 876.